I just wanted to post a little bit of inspiration here! 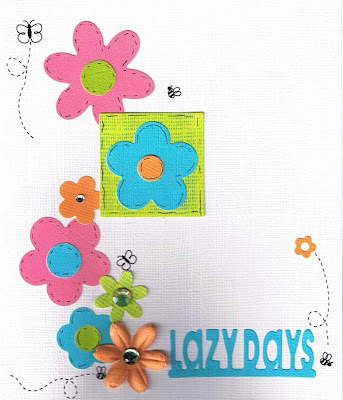 Here's a card Rena made last week using a variety of QuicKutz flower dies & some QK rub ons, isn't it bright and cheery? 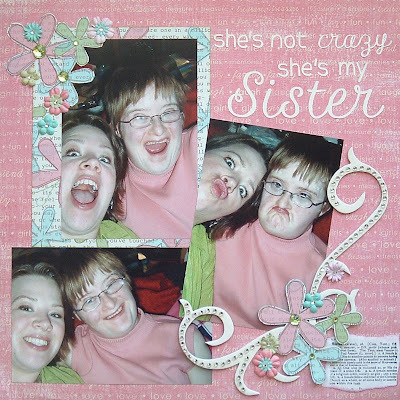 And here's another fun layout featuring my sis-- some candids from a girls night a few weeks ago, I had fun creating this layout & piling on the bling! I used a new paper by Junkitz together with one I've been wanting to use for a while by Carolee's Creations, don't they look fab together? ... and a side note! I recently lost all my bookmarks on my browser, including some of my favourite blogs to visit! I'm hoping some of you that visit me will post and share your blog addy as well as a some of your faves :) If I get a big response, there will be blog candy involved... more details to come! Hello! I'm sure I wasn't on your original blogroll, but please check out my blog at www.cakvd2.blogspot.com. I'm mostly a scrapbooker, but I dabble in cards too. Hope to see you there!